Prairie Meadows Senior Care in Omaha, NE, offers one and two bedroom and studio floor plans for residents with both memory care and respite care needs. We offer a full-time, on-site nursing staff and a group of dedicated therapists to assist in the healing process and bring support and meaning to each of our residents. Memory Care: Prairie Meadows Alzheimer's Special Care Center is the only Alzheimer's community in Omaha that offers our exclusive Meaningful Moments® program. Through this program, our caring staff weaves the life stories of all of our residents into the fabric of their days here. The result is a comforting feeling of familiarity and meaning for those seniors with dementia needs in our community. 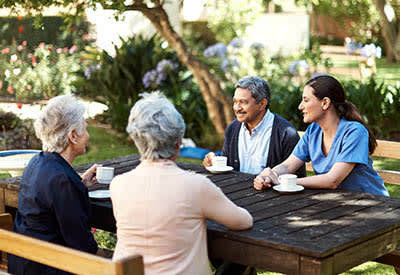 Respite Care: For those seniors recovering and in need of rehabilitative care, we offer a full nursing staff with 24-hour care and visiting physicians, speech, occupational and physical therapists and a podiatrist to help aid in healing and recovery. In addition to the above services, all community members of Prairie Meadows Alzheimer's Special Care Center have access to our full selection of services, amenities and entertainment options. Transportation is provided to shopping, dining and weekly excursions and three chef-inspired meals are served per day in our restaurant-style dining room.